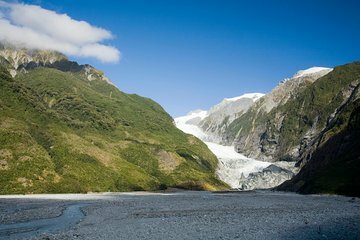 Take a 3-hour guided hike to the terminal face of Franz Josef Glacier, scrambling along an exclusive pathway over the riverbed of the mighty Waiho. During the interpretive valley walk to the glacier, your guide covers the geographical features of this magnificent alpine landscape. Upon reaching the viewpoint, you’re treated to an up-close look at the advancing glacier. Numbers are limited to 13 people per group for a more personal experience. Take a day trip from Franz Josef to experience New Zealand's stunning nature and picturesque views of the Franz Josef Glacier. Make your way to the operator’s base in Franz Josef to meet your guide and get geared up with proper equipment for your 3-hour valley walk to Franz Josef Glacier, which requires a basic level of fitness. After a brief bus ride to the outskirts of the glacier, follow your guide on foot during a valley walk through a forest and up alongside the Waiho River. The hike along the rocky riverbed takes you via exclusive trails amid a magnificent alpine landscape en route to the glacier’s rapidly changing terminal face. Learn from your guide about the glaciology and natural history of Franz Josef, also known by its Maori name as Ka Roimata o Hine Hukatere, and hear about the imposing giant’s path of retreat. Close to the terminal face, you'll be rewarded with impressive views of the marbled blue ice and deep crevasses. Finish with the return hike through the valley back to the minivan and transport to the base. The glacier walks are quite challenging as the valley floor is undulated and becomes steeper nearer the terminal face, and clients need to be fit and able. Andy was an excellent guide and was very knowledgeable. He also had a fun sense of humour, and the hot chocolate he provided his Grans recipe, was a nice touch. We felt safe and secure at all times. The walk was a good distance and physically achievable for most people. 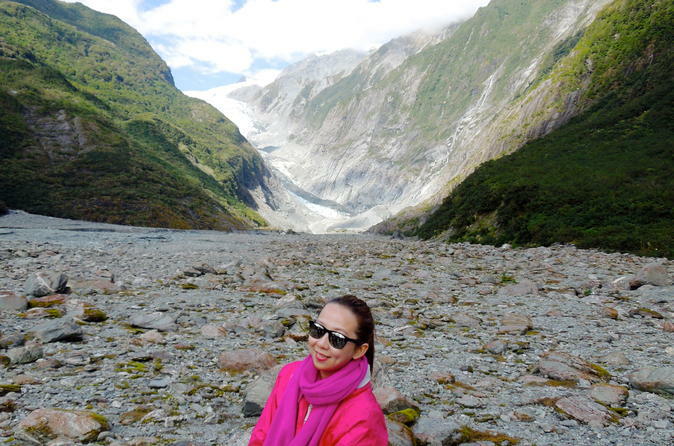 It was amazing to see Franz Josef Glacier in this way. We had a great time, the guides were very knowledgeable and friendly. The use of boots enabled us to walk through the many streams and the scenery was awesome. To see the power of ice and water so close up is breathtaking. The 2 hours I spent on this walk were well worth the time and effort. We had a very small group only 5 people our guide, all reasonably fit, and we kept a steady pace, with periodic stops for pictures. Our guide, Bryan originally from Colorado, USA, was relaxed and knowledgeable, and answered our many questions. At no time did we feel we were being rushed, and we had plenty of time to take pictures and admire the scenery. The tour takes a couple of paths that deviate noticeably from the regular path, which occasionally gave us the sense that we were the only ones hiking to the glacier look-out point. Although the tour was very enjoyable, I was somewhat disappointed at how far away the mouth of the glacier is - it's about 1 km 0.6 miles away from the lookout point. But this obviously doesn't reflect on the quality of the tour. Loved this tour. Our tour guide was excellent and very informative. Would definitely recommend. Phil was our guide. He was humorous and knowledgeable. He treated all with some hot chocolate when we got to our destination point. Great views as well!!!! Great walk through the valley via private path, highly recommended. Good walk into the valley. The Valley Walk is a moderate out and back with very little elevation change. The most difficult part is the rocky terrain. Olivia, our guide, was knowledgeable and friendly. Along the way there are a couple of nice photo opportunities. One could do the walk on his/her own not sure if the cost of the tour is worth the additional knowledge.